RIO DE JANEIRO (AP) — Under mounting criticism Saturday, Brazilian soccer club Flamengo defended its management of the training ground where a fire killed 10 of its academy players — all between 14 and 16 years old — at a dormitory that had been registered with the city as a parking lot. Rio de Janeiro’s city hall said in a statement that Flamengo was fined 31 times because of infractions at the Ninho do Urubu training ground, which had to be temporarily closed in October 2017. The club did not pay 21 of those fines. City hall also said the sleeping quarters where Flamengo’s players died was irregularly licensed as a parking lot. Three teenagers injured in the fire were still in the hospital, including one in serious condition. Flamengo’s CEO Reinaldo Belotti pushed back on accusations, saying the licensing issues “have nothing to do with the accident.” He said the sleeping quarter was a proper lodging and not an improvised structure. Belotti linked the heavy Rio rains earlier in the week to what he called “a tragic accident” and said unstable electricity could have sparked the fire. The Flamengo executive did not take questions and did not explain why the sleeping quarter was registered as a parking lot in the project originally sent to Rio’s city hall. Whether bad weather led to a power surge, common in Rio de Janeiro and other parts of Brazil, the club has not detailed what measures, if any, were in place in case of fire. It was also impossible to ignore a sobering reality: the sleeping quarters must have included such flammable material that 10 young men, all in the best shape of their lives, were not able to escape before being consumed by the flames. “Flamengo is responsible because it should take care of its athletes and the dormitory where the fire took place was not in the club’s project,” said Filipe Sales, a 26-year-old fan who stood Saturday outside team’s headquarters in Southern Rio, where hundreds gathered for a symbolic embrace. “This has to be an alert for every club in this country, and authorities must investigate severely. Ten kids are dead and this cannot happen again,” Sales said. The incident came just two weeks after the Jan. 25 dam collapse in Brazil unleashed a flood of mining waste in Minas Gerais state, killing at least 157 people and almost as many missing. On Wednesday night and early Thursday, torrential downpours and strong winds killed at least seven people and left a trail of destruction, stirring a wave of controversy over shoddy infrastructure and lax oversight in Latin America’s largest nation. The cause of the fire was still unknown, although authorities were looking at a possible short circuit in the air conditioning system. The administration of Mayor Marcelo Crivella said it would open an investigation, while local police said they have already heard testimony from 13 surviving players and three Flamengo staffers. A former Flamengo player who spent 10 years with the institution was critical of its handling of young players. He asked to remain anonymous because he still played in a professional capacity. 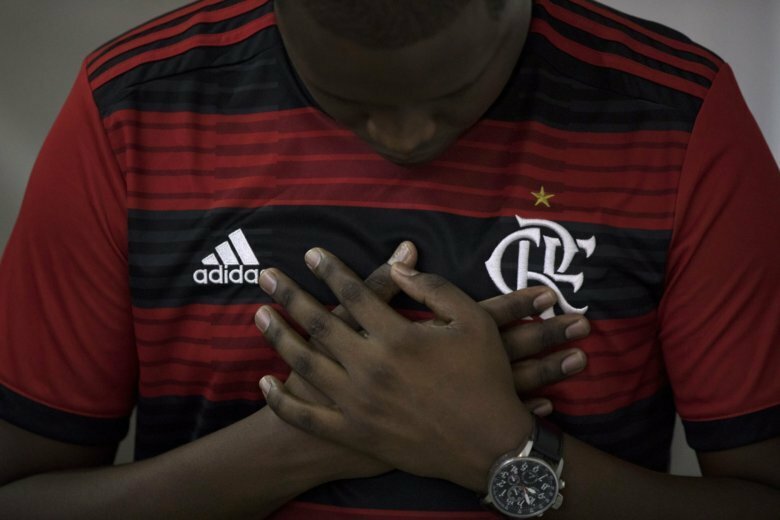 In the meantime, the scope of the tragedy became increasingly clear as the Flamengo club announced that all the victims were between 14 and 16 years of age. Forensic experts identified eight of them: Arthur Vinicius de Barros Silva, Pablo Henrique da Silva Matos, Vitor Isaias Coelho da Silva, Bernardo Augusto Manzke Pisetta, Gedson Corgosinho Beltrao dos Santos, Athila de Souza Paixao, Rykelmo de Souza Vianna, and Christian Esmerio Candido, a 15-year-old goalkeeper that had already played for Brazil’s national team’s youth divisions. Player Jhonata Ventura was still in serious condition, while athletes Cauan Emanuel and Francisco Dyogo were listed in stable condition. A club spokesman said DNA tests would identify the heavily burned remains of other victims, a process that could take months. Throughout Brazil, mourning rituals and commemorations were under way. In the southeast city of Volta Redonda, friends and relatives carried the coffin of Arthur Vinicius, who would have turned 15 years old Saturday, and embraced one another in grief. “He was 15 years old. The same day he was born is the day I’m burying my son,” said the teen’s mother, Marilia Barros da Silva. Flamengo’s anthem was played during the memorial service, and the club’s flag was placed onto the coffin. “He could be here with us now,” Souza said. Players from the professional Rio-based club arrived at Ninho do Urubu on Saturday also dressed in black for a training session and prayed with Flamengo coach Abel Braga. The team’s weekend match against Fluminense in the semifinals of the Rio de Janeiro state championship was postponed to Wednesday. Like many professional clubs, Flamengo has a development program for promising young players. Many, particularly those who live outside of Rio de Janeiro, stay at the facilities while training. Not long ago, Brazilian-born soccer stars Vinicius Jr and Lucas Paqueta were living at the same training ground. Vinicius Jr now plays for Real Madrid and Paqueta plays for AC Milan. Savarese reported from Sao Paulo. Video journalist Renato Domingues in Rio de Janeiro contributed to this report.